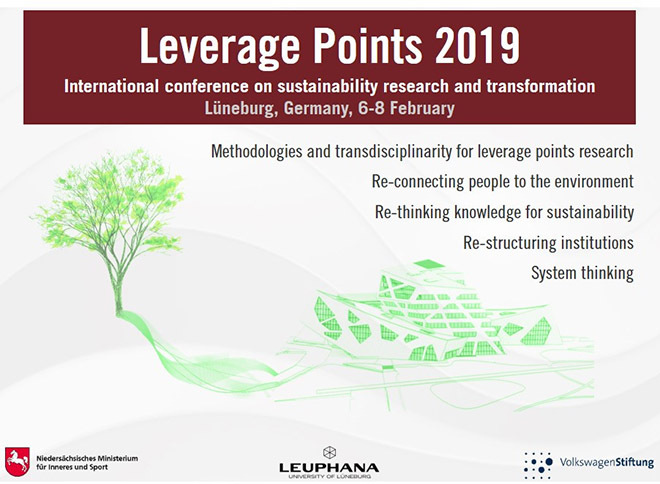 At the Leverage Points conference held at Leuphana University in Germany in February 2019, I organized a panel entitled “Transformative Co-Production Experiments as a Nucleus for Societal Learning”. This panel built on activities that began at the International Sustainability Transition Conferences 2016 (Wuppertal) and 2017 (Gothenburg), where a thematic research network on learning in sustainability transitions was formed, drawing together members of the social-ecological systems research, organizational science, and educational science communities. Developing learning concepts to understand co-production experiments and their outreach. We will explore how micro (e.g., individual and group) to macro learning (e.g., structural change at the societal level) concepts help to understand how co-production experiments foster critical links between personal, small-group, and societal learning. Facilitation of mutual learning among diverse stakeholders as a lever for advancing changing perceptions, attitudes, and behaviors (e.g., towards global ecological citizenship). We will consider how diverse knowledge practices (traditional, cultural, procedural, and scientific) enhance meaning making and knowledge co-production, while taking challenges like power dynamics into account. Co-production experiments have complex and case-specific features that impede transfer of findings between interventions. What kinds of learning are possible when methods are not standardized and other conditions for reliability, scalability and transferability do not hold? How can we create opportunities to engage groups of people with scary, real-world problems and complex sustainability challenges? How do we facilitate good learning processes? How do we pivot from learning to action? At the conclusion of the session, Blane Harvey provided a brief account of the work of the learning community. This session was linked to another session that I organized: Experiments in Transformative Coproduction, which focused on the possibilities offered by a recent explosion of transformative coproduction experiments, such as “T-Labs”, “Co-Labs”, “Bright Spots”, “Seeds”, and “Learning Networks”. In this session, we explored learning efforts that are experimental both in the sense of innovative process design and in their intention to probe the potential for leveraging systems transformation. We highlighted some promising cases, brought practitioners into conversation about the design and implementation of co-production experiments to enhance co-learning and realize their transformative potential. Through both of these panels, our hope was to increase mutual support among researcher/practitioners who share a passion for figuring out how to enhance transformative learning.